If your having trouble seeing the problem the header is sagging almost three inches and is not continuous to its bearing point. To back up, our original scope of work at the beginning of the week was to have the existing venetian plaster overhung with drywall. The plaster was in bad shape and would have been pretty difficult to repair plus I am not a fan of the look. So we hired (luckily) two skilled carpenters to hang new material. Over the weekend, Jeff's parents were nice enough to prime the walls (we were nervous about any smoke smell being trapped in) and first thing Tuesday morning the carpenters started. We should have anticipated a problem as the sag was apparent to even an untrained eye but we just didn't think about it. You can sort of see it from these pictures taken before we moved in. Upon opening the wall, we discovered that the header (the horizontal piece) was not long enough and that its bearing point was rotted out due to old water and termite damage (sorry to Jeff and any other structural engineers/contractors reading this if I am not explaining it correctly). Jeff, who is a structural engineer, and our two carpenters spent yesterday morning diagnosing the situation and coming up with a solution. 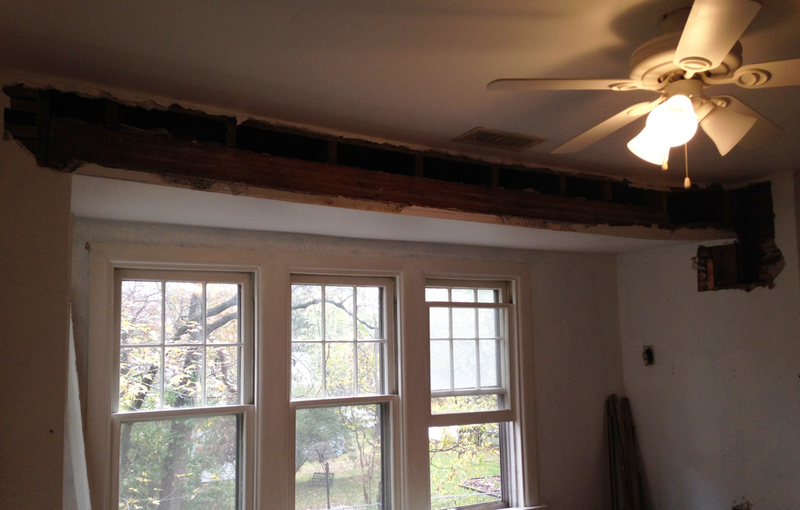 The plan involved shoring up the ceiling, removing the old header and replacing it with a new one that is the appropriate size and length, removing the rotted out stud and replacing it and re-insulating - oh and then drywalling. All and all it didn't end up costing us that much more time or money but we were lucky to have two very skilled carpenters and Jeff's knowledge to know how to address the situation properly. We are back on track today and hope to have the drywall completed by Friday or maybe Monday. More pics to come!